My girlfriend has had enough with North Korea. She is sick of all the photos and blog posts, and I haven’t even told her about the spring 2012 North Korea trip I’m planning. To get her off my back and to buy a little time I’m going to dedicate this blog post to Taiwan, her native country, and a pretty fantastic place. Time to give Taiwan a little love! The ship I have been working on as Chief Mate has been based out of Taiwan for the last two years. We do visit other countries, but the currents and internal wave fronts of the Luzon Strait are some of the most interesting in the world from a scientific/oceanographic viewpoint, so we keep on returning to this funding rich region to conduct our scientific expeditions and research projects. The ship normally ports in and out of Kaohsiung, Taiwan’s 2nd largest city. “Kaohsiung is changing!” proclaims the billboard outside the highrise apartment that I had leased for six months this year. I would often tease my girlfriend by using that phrase, but honestly Kaohsiung has changed – and changed for the better. Years ago it used to be a forgettable port city, but a lot of effort and investment has gone into revitalizing the waterfront districts in the run up and for the hosting of the 2009 World Games. You can easily rent a bike from an automatic vending machine and enjoy the large network of paths throughout the harbor district. Excellent public art is to be found at the Pier #2 Art Center. Further down the harbor front you can relax with a drink or enjoy dinner at the Fisherman’s Wharf while watching cargo ships pass by. A short ferry ride across the harbor will take you Cijin Island, there you can enjoy fresh seafood and relax at the beach. In the city you can visit the popular Liuhe Tourist Night Market, but for a better deal and a more local experience get an oyster pancake at the night market tucked several blocks behind Grand Hi-Lai Hotel. Other city attractions include Monkey Mountain, and the “Little Japan” shopping district located in the alleys by the Central Park MRT station. If you do happen to pass through Kaohsiung, make sure to stop by and say hi to the girls at the Night Owl Bar – tell them Joseph sent you! I have mostly focused on Kaohsiung as it’s the place I know the best, but it’s highly worth while to head south and check out the tropical beaches and nightlife located in Kending. Taiwan is also blessed with an abundance of hot springs (one of my favorite activities), high mountain peaks, and steep gorges for the outdoor enthusiast. Taiwanese people are generous, friendly, and outgoing – no matter where you explore you will be welcomed as family! 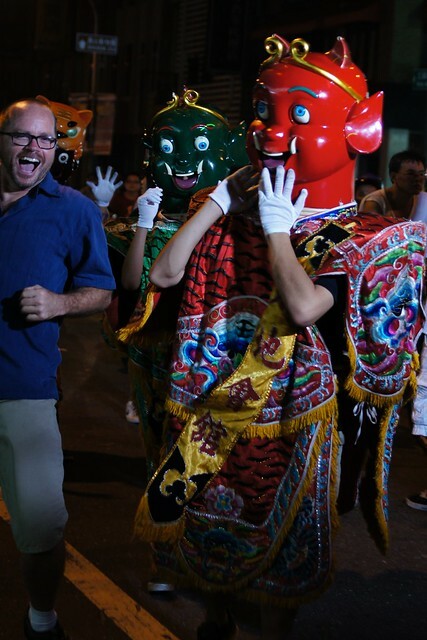 Captain Wes Hill dances with the gods in Kaohsiung, Taiwan.